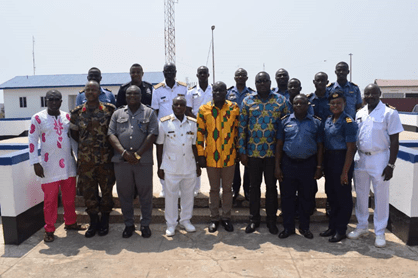 Colonel Joseph Malik Punamane, the Head of Security at the Tema Port was today the centre of attention and praise when he and eight Naval officers, were the subject of a stripe wetting ceremony. The ceremony, which came off at the Tema Naval Base with an audience of security personnel from across the Police, Fire Service, Navy and Military, saw Punamane, who was recently promoted from Lt. Col to Colonel, receiving shower of praises for his contribution to security in Ghana. “Lt. Col. Punamane has worked for six years in his position, and today is being celebrated as a Colonel. The promotion creates a huge gap and goes with increase in benefits including; salary. Being a Col. Means the government will commit a naval ship to you. One ship costs 13million dollars. Government will only commit something of that value to somebody whom it can trust,” Commodore J.O. Kontoh, Flag Officer Commander in charge of the Eastern Naval Command said. Lt. Col. Punamane was the only army personnel in a group of nine officers who were promoted. The rest were; Navy Officers. “What a happy day we have this afternoon celebrating with our personnel who have been promoted. Dedicated to work and disciplined. Not only have they waited patiently for their recent promotion. I congratulate you all,” Commodore Kontoh said. He praised them for their dedication to duty and their patience. The praise for Col. Punamane did not end there. Mr. Kingsley Darko, Assistant Port Security Manager at the Tema Port also chimed in from another angle. According to him, Col. Punamane cemented his place in history as one of the Ghanaian heroes of the Liberian war and the peacemakers of the Bawku crisis sometime ago. He recalled how Col. Punamane brought his sense of duty to the Tema Port, where he encouraged his subordinates to see the Tema Port not only as a security zone, but also, a business hub. Under Col. Punamane, he said, there had been smooth collaboration between the Ghana Ports and Harbours Authority and the Ghana Navy, leading to the effective fight off of crime on Ghana’s seas. On his part, Nii Kwartei Titus Glover, Deputy Minister for Transport and MP for Tema East attributed the milestone that the promoted officers achieved to a string of virtues including; hard work, dedication and discipline. He said, the virtues that brought the celebrants this far were virtues that the Ghana Army had pursued to fight off illegal mining, (galamsey). “For sometime now, I have realised from watching Al Jazeera that River Pra and River Ankobra had become clean because of stoppage of galamsey by the army. Today, I am glad that these hardworking personnel of our security forces have been promoted. I want to assure them that this will not be the last promotion,” Titus Glover said. He praised Commodore J.O. Kontoh for his brilliant and exemplary leadership. The audience at the ceremony held at the Tema Naval Base also included; the Metropolitan Chief Executive for Tema, Felix Mensah Nii Annang-La, who used the platform to raise two issues. The MCE urged for the close season for fishing to be looked at and expressed sadness about the wanton arrest of fishermen by the Navy for bad fishing practices. According to him, fishermen were constrained to adopt some methods of fishing because the oil find in Ghana’s waters and subsequent drilling had warmed the surface of the sea. This he said had compelled the fishes to stay deeper in the water rather than coming to the surface, thereby compelling fishermen to use some other unapproved methods to fish. He pleaded with them to allow light fishing as a case study for Ghana so that a peaceful and concessionary solution can be found. Also, in attendance were; Commodore Kwarfo, Assistant Commissioner of Fisheries, Commander Abu, of the Eastern Naval Command, Mr. Stephen Ashitey Adjei, Executive Member of Tema East NDC, Nene Ofoe Teye, Mr. Alhassan Baidoo and Mr. Sammy Adjetey, all Senior Officers of GPHA Security Department.